Baksei Chamkrong (Khmer: ប្រាសាទបក្សីចាំក្រុង) is a small Hindu temple located in the Angkor complex (Siem Reap, Cambodia). It is dedicated to Lord Shiva and used to hold a golden image of Him. The temple can be seen on the left side when entering Angkor Thom at the southern gate. It was dedicated to Yasovarman by his son, King Harshavarman I. The temple was completed by Rajendravarman II (944-968). The pyramid measures 27 metres across at the base and 15 at the summit for an overall height of 13 metres. Harshavarman I began construction or perhaps dedicated statues at the site in the early 10th century. 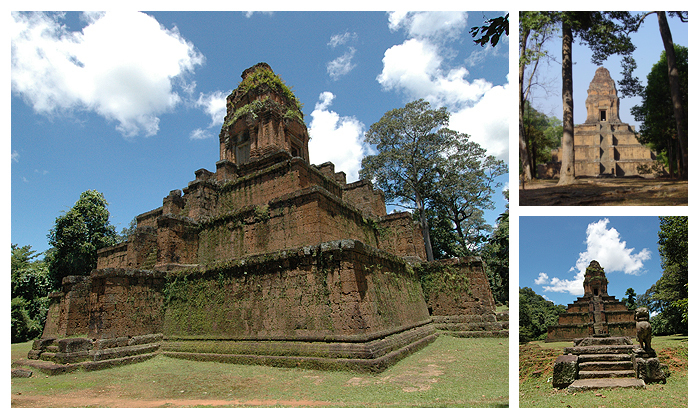 It was later improved/restored by Rajendravarman II shortly after the capital was returned to Angkor from Koh Ker. According to inscriptions on the doorway, Rajendravarman II consecrated the temple with the installation of a golden Shiva image in 947 AD. It may have also served as a funerary temple. Combine with a visit to the South Gate in the morning or Phnom Bakheng in the evening. Lighting is best in the morning.